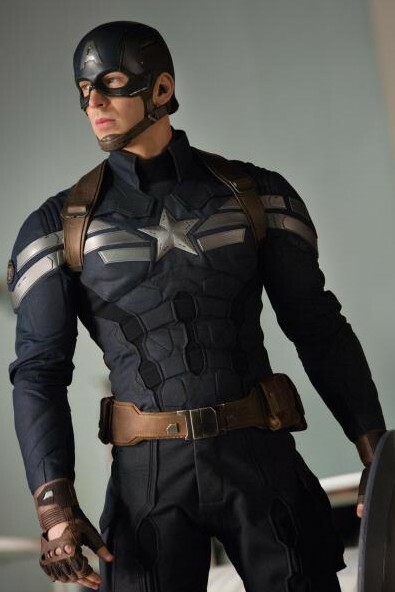 Ever since I was a kid, Captain America has always been my favorite superhero. Sure I loved all the Marvel characters, but there was just something about Cap and his “never say die” attitude that resonated with me. Over the years, I built up quite the Captain America collection (action figures, comic books, statues, a custom-made fiberglass shield, original art, wedding ice sculpture, etc.) and even had the pleasure of interviewing a number of different Marvel writers and artists who worked on the comic series. So when I had the opportunity to finally meet the Star-Spangled Avenger himself, in person, I nearly… well.. I almost passed out. Yes, I’m a geek. I’m a fanboy. I’m a card-carrying member of the Avengers fan club. That didn’t stop me, though, from meeting the Super Soldier head on in a professional manner, as myself and roughly 25 other bloggers cornered the Captain in a beautiful room at the Beverly Hilton Hotel earlier this month for a private bloggers-only interview session as part of a #CaptainAmericaEvent. Now, you may say it’s only Chris Evans, the actor that we got to talk to. And you go right on believing that. I know his secret, though. Even with that scruffy beard, I know he really is Captain America. So while the majority of mommy bloggers drooled over their notes and made goo goo eyes at the First Avenger, I took it upon myself to lead the mission and get to the bottom of what makes a Super Soldier tick. From Chris’ inspiration to an arsenal of shields and even working with a new sidekick The Falcon, we all got to know the real Steve Rogers (a.k.a. Captain America), as he cheerfully and honestly answered all of our questions. 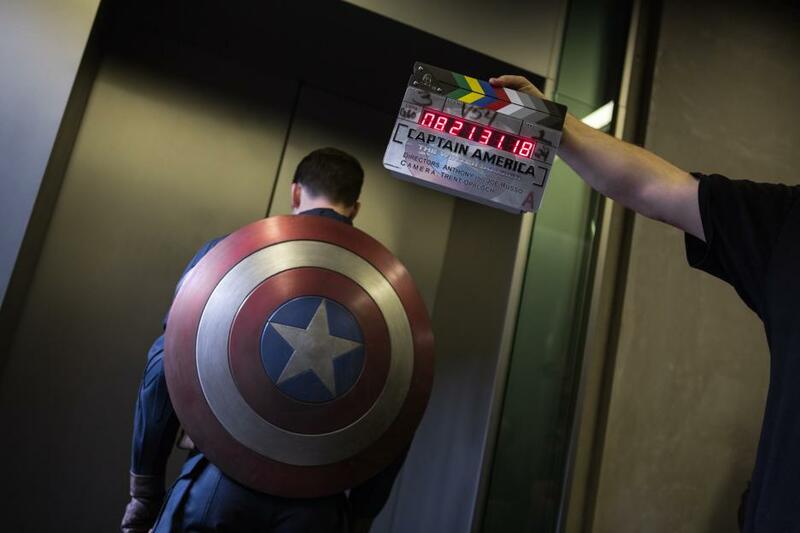 If Chris Evans is indeed “acting” when he plays Cap, you certainly couldn’t tell from his demeanor. The guy’s incredibly humble, down to Earth and as friendly as can be. He also has a genuine smile that just screams, “You can completely trust me with your life.” Kind of like a certain Star-Spangled Avenger, wouldn’t you say? 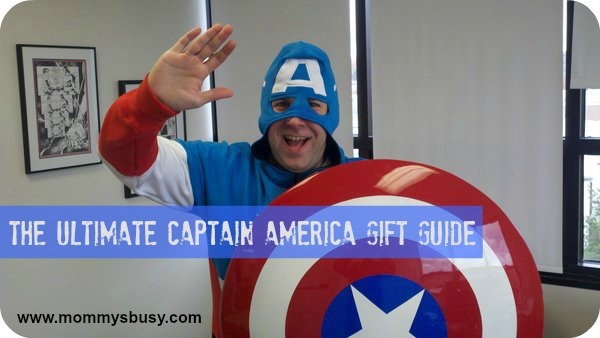 What qualities in Captain America do you find in yourself? Chris Evans: Aww, how do you answer that question? He’s such a good guy. All right, what do I find in myself? I think he’s always trying to do better. I don’t think I’m as good of a man as he is, but I think as good of a man as he is, he’s always trying to improve. So the one thing I am working towards on a daily basis is just trying to find ways to evolve. Do you find that a character like Captain America plays like a role model? Chris Evans: Oh, completely. There’s a kid that I grew up with named Charlie. Charlie Morris. He’s like, the best kid I know. He was an Eagle scout. And being an Eagle scout is not easy; you’ve got to really do it for a long time. But he’s just such a good man, and he genuinely, genuinely puts himself last. He lives by a code. And so when I took the role, I told Charlie, “Listen. I’m modeling this after you.” And it’s such a great character to aspire to be. How difficult was it to shoot that crazy elevator fight scene? Chris Evans: That was tough. That was the first thing we shot. It was three days, and it was awful. It was awful because you have these great stuntmen that I had worked with for about a month prior, choreographing that fight in a warehouse where we had built a little fake model elevator. So you’re rehearsing the dance. It’s literally a dance. You might as well be on your feet, doing the salsa. It literally is just rhythm and steps and beats, and with every person that you disable and drop, the fight continues with me. As these guys go off and take coffee breaks, I’m stuck there, doing every single aspect of the fight. And there’s no masks. So there really wasn’t much opportunity to hide with a stuntman. It’s just brutal. It’s the type of thing where working out for two, three hours a day is exhausting. But for a scene like that, they yell action and you give everything, even though it’s a fake fight. It’s exhausting. They call cut. You have about 30 seconds to kind of catch your breath. And then you do it again. And you do that all day, so by the end of the day you realize, I’ve been working out all day. All day! This isn’t normal. This isn’t human. You fall asleep before your head hits the pillow. So at the end of those three days, at the end of this scene, there was just this collective applause. It really felt like a giant accomplishment, and a solid way to kick off the movie. It was a chore but worth it. What was it like seeing yourself as Captain America for the first time? Chris Evans: Terrifying. I think the first time I saw it was back when I was still pretty insecure and a little apprehensive about taking the role. So, it was a real dichotomy. There was simultaneous joy, but at the same time, a deep fear. That’s eroded over time, and now it’s very familiar. It feels very comfortable. It feels great now, and damn, if I had said no, I would have been the biggest fool on the planet. Who would win in a fight between Batman and Captain America? Chris Evans: Oh. You’ve gotta go Capt. America. Come on. I thought you were going to say Capt. America and the Human Torch. That’s a tougher question. Batman? Batman? What does he have? Toys? Don’t write that. Don’t write that. It’s gotta be Cap. If you had a second choice for a superhero role, who would you choose? Chris Evans: You know, I’ll say it: I miss Johnny Storm. I liked the Human Torch. He was a fun guy to play. I liked, you know, I would say someone like Iron Man, but no one can touch Robert Downey Jr. It’s fun to play someone with life. It’s fun to play someone who enjoys embracing their abilities, and Johnny Storm was a lot of fun to play. And that costume was comfy. It was like a wetsuit. It was perfect. How many different shields did you use during filming and did they let you take any home? Chris Evans: Yeah. They did. They gave me one. There’s probably like, four or five different shields. There’s the one shield that’s heavy and ridiculous, and you know, that’s just for show. Then every now and then if you gotta hit somebody, you get this kind of fiberglass shield. And if you have to throw it, you get a foam shield. But there’s a bunch of different shields but they did send me one. Chris Evans: It’s sitting in my house. It usually comes out after everyone’s had a few drinks. Photo shoots happen. What was your most memorable moment during filming? 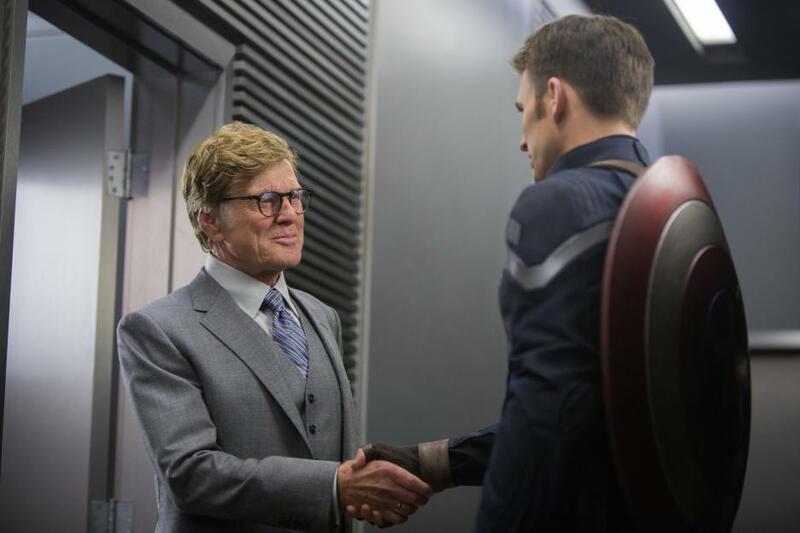 Chris Evans: When I saw Robert Redford walk in the door. Everyone was nervous that day. Everybody was scared. There was a whole buzz on the whole set. But it’s Robert Redford. You know. I grew up watching this guy. He is a living legend. So it was intimidating. It was exciting. It was rewarding. It was surreal. With the fighting styles, what was your preparation like with the martial arts? Are you comfortable with it? In between the first Captain America movie and the Avengers, I had played the Captain America video game. Im not really a video game guy. But someone handed me the controller, and I was playing, and the way Cap moves in the video game, there’s a fluidity and it’s very acrobatic. It’s very aerial. He uses his environment, and it’s almost this beautiful, smooth dance, and when I first met with the [directors, the] Russos, I said, “Have you played the video game?” And I swear to God, they said: “You know what? We referenced the video game, too.” I said, “Good, good, we’re on the same page. But that means we need to incorporate a little bit more of an acrobatic approach to fighting.” And so we put myself in gymnastic classes, which is something I always wanted to do, kind of, anyway. [LAUGHS] I mean, I wanted to go play on like, the balance beam, but it was more like tumbling, essentially. Parkour-style gymnastic stuff. Flipping, and spinning, and just kind of getting a sense of your body in the air. So we did about two months of that. We did two months, a few hours, each day, and it was invaluable. It really lends itself to a lot of those fight scenes. How do you get into the mindset of a man out of time? It’s not so much about tech shock; it’s more about adjusting to society, I suppose. Or just the way government works. I think in the ’40s, Nazis are bad. We can all agree on that. I think given those technological advancements, it becomes a little bit harder to ensure the freedom that we offer and promise. And, as a result, it becomes this gray area of, in order to guarantee people’s safeties, you may have to infringe upon their civil liberties. And this is where it bumps for Cap. This isn’t something he’s okay with. There’s a good line in the movie where Nick Fury says, “SHIELD takes the world as it is, not as we’d like it to be,” and that’s a tough pill for Cap to swallow. So, this is all just new for Cap, and it just rubs him the wrong way, and it’s a growth experience for him. How is it working with Anthony “The Falcon” Mackie? Chris Evans: Did anyone see the press conference? I mean, he’s fantastic. Is he gonna come in here at some point? [LAUGHS] I can’t wait. I want to be in the audience! He’s great. I really like him. Him and I, we’re very similar people, and this is my third movie with Mackie, you know? We’ve done, outside of the Marvel Universe, we’ve done a couple of things together, and the first time I met him wasn’t even on a film set. We met out one night, and just you know, kind of got along, right away. He just has this innate energy. Movies can be extremely tedious and tiresome, and I have never seen him drag on a film set. He comes to set, and immediately has an energy, and everybody is smiling and laughing. And, you know, certain days when he’s not there, you’re like, “Why? Why is this day awful? Mackie is not here! 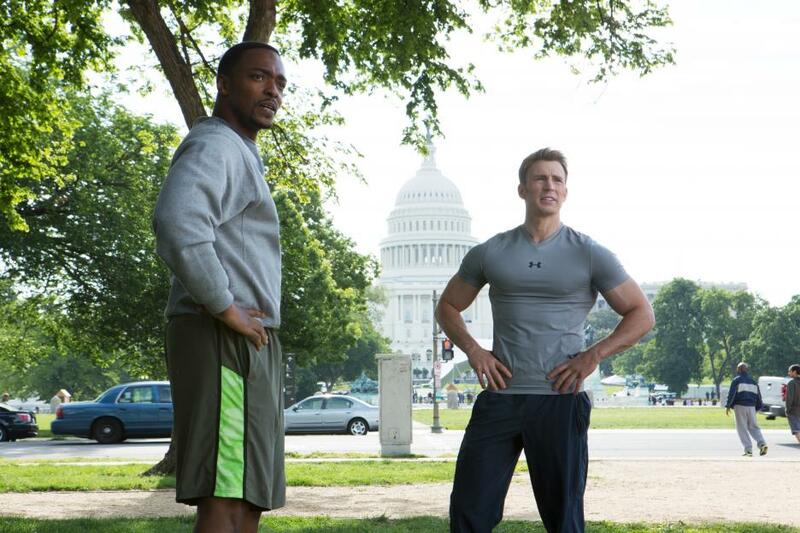 Where’s Mackie?” He’s just a ball of energy, and you know, he’s just a very optimistic person. And it’s infectious. 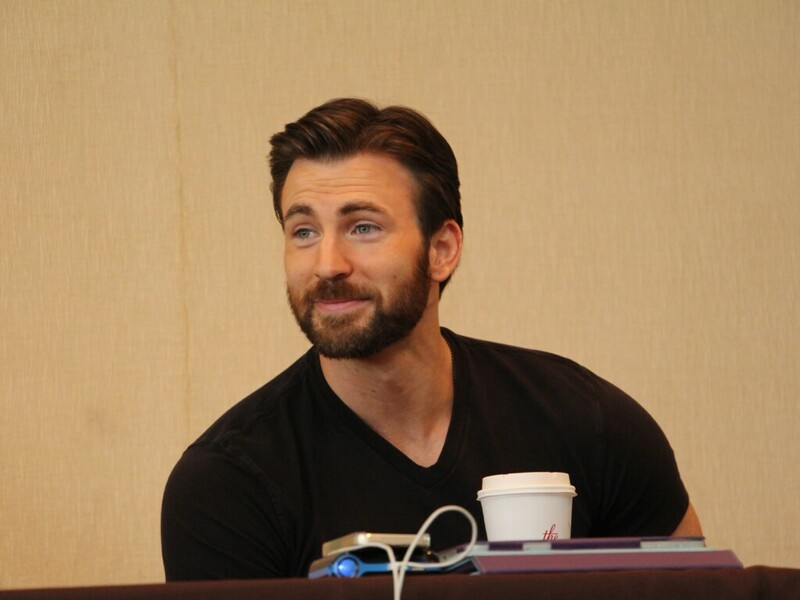 A bearded Chris Evans (a.k.a. Captain America) surrounded by his adoring blogging fans. It’s good I didn’t interview him because I would have been one of the drooling moms there LOL. If it had been Robert Downey Jr, I probably would have passed out haha. Great interview. Glad you got to meet your hero. OMG I’m SO totally jealous right now! I love these interviews. It gives such a more personal side to the actor and the story 🙂 .. fun reading how things are done as well such as shield supplementing based on what the scene called for. I saw the picture of Chris Evans on Pinterest and I just had to click over. I am beyond jealous that you got to meet the First Avenger himself! I also fall into the category of ladies who want to make goo goo eyes at him, but I also think that Chris is an excellent fit for the character. I’m so excited about the movie! Thanks for sharing the interview (…and the pictures)! Fantastic interview Andrew – I knew you were enjoying the entire interview as much as we were. I am a HUGE fan of Captain America too! He’s my all time fave Avenger no doubt. I love what he stands for and his true blue loyal attitude. He has morals and standards the others like Iron Man seem to be lacking. Love this guy! How exciting for you Andrew! I can’t wait for my hubby to see this movie. 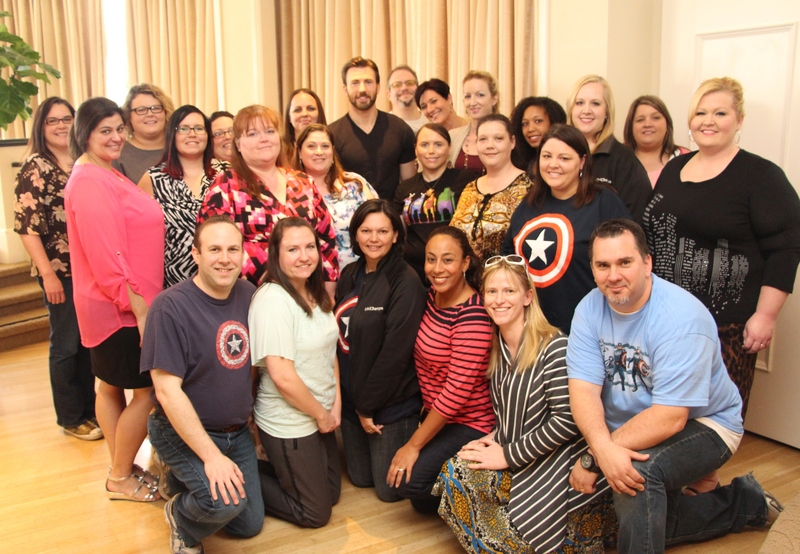 The interview with Chris Evans was amazing and his response for the elevator ride scene was so great (…doing the salsa)! Thanks for sharing, Andrew. Very nice interview! I’m really looking forward to seeing this, and so is my husband!